I ♥ Saturday mornings, especially when Mr. Painted Quilt says, “How would you like to go to the Big City to do some shopping?” All I needed was 20 minutes to have a shower, dry my hair, get dressed and we were out the door and on our way. We arrived in front of the not-so-local quilt shop (65 miles away) at about 9:45, fifteen minutes before it opened. Instead of waiting, we went to my favorite green grocers called Farm Boy, conveniently located almost directly across the street. Their fruits and vegetables are second to none and the aroma of freshly baked breads made us light headed. Forty minutes and six grocery sacs later, we were back in front of The Running Stitch. 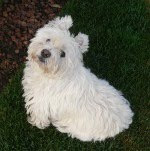 While I went inside to shop and chat with the girls, Mr. PQ and Mac our Westie went for a walk…a long walk. I specifically wanted to replace my little silver thimble tip that mysteriously disappeared last week. (I think it inadvertently wound up in the trash…by me!) I use this particular thimble when I do any hand stitching or quilting because it’s so tiny you don’t even realize it’s there. It’s the one in the little packet on the right side in the photo below. I also picked up a Jo Morton book, some Civil War fat quarters, a red Pigma pen for my redwork and some embroidery needles. 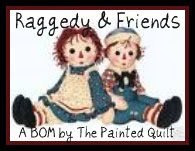 I brought along my Raggedy & Friends quilt for them to have a look at. Well the gals helped me to decide as to what I will do with it. I will be releasing it both as a hard copy and PDF pattern as soon as I can set aside the time to do it. For all of you who have shown interest and have written to me both publicly and privately, please bear with me because it’s a huge job. I’ll let you all know here when it’s available. By then it was lunch time so we stopped and had some Chinese. Yummo! Our final stop was at a smaller quilt shop in the town where we live. They were clearing out some Kansas Troubles fabric at $5 a meter (39”) and at that price, I bought l-o-t-s of each! Last night I finished my Irish Chain mini quilt. What a fun project to work on! I hand quilted a feather wreath in each of the setting blocks. And I used some red toile fabric for the backing. Gee, maybe we should make each weekend last for 7 days because that’s when I seem to be most productive! First thing on Saturday morning’s agenda was to reorganize my studio because I was having problems with my laptop being situated too close to the modem which was transmitting a very strong wireless signal causing my computer to freeze when web browsing. Because there is only one telephone jack in the room, the modem had to stay where it was. I ended up moving my desk to where my sewing station used to be and now things are just tickety-poo! Then I shifted my sewing table over to where the desk used to reside. Did you notice my scissor collection on the treadle machine in the background. It’s grown somewhat. *wink* And that’s not all of them either! Here’s one of my stash cupboards where I ‘shop’ for fabric. And my Featherweight station where I made my nine patch minis not too long ago with bins of wool and fabric stored beneath it. The first thing I did after the rearranging was to cut and prepare the fabric for Kathy’s Irish Chain challenge which I spoke about here in the last paragraph. I decided upon a turkey red and a white tone-on-tone. I then made up 20 new siggy blocks for the international siggy swap that I belong to because I had completely run out of them. I received three last week and I needed some to send out in return. I started to piece the mini Irish Chain quilt on Saturday night but fatigue set in so I set it aside for a fresh start on Sunday. When I turned in on Saturday night, I started to read the 11th book in the Elm Creek series called The New Year’s Quilt. Yesterday, I completed the top to the Irish Chain challenge. Do you think I should add a small border or just leave it as is? Today is a holiday in Canada. Mr. Painted Quilt took me out for a wonderful breakfast and the rest of the day is mine to do with as I please. 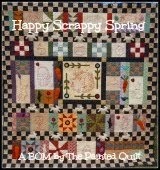 It must be Spring Market time because Amy is hosting another on line Quilt Festival. Allow me to tell you a little about my entry. I had been thinking about this design for quite a while but I didn’t even want to attempt to put pencil to paper before all my swaps and Christmas gifts were put to bed. So around the beginning of December 2009, I started the preliminary sketches. I stitched and pieced over the Christmas holidays and gave the flimsy to Nancy (no blog)…my friend and machine quilter extraordinaire…during the first week of January and gave her ‘carte blanche’ to work her magic on it. Everything that Nancy touches is an original work of art and I left the quilting part in her trusty and capable hands. I truly believe that the longarm quilting fairy resides at Nancy’s house. What an incredible job she did! Every square inch is custom done. The name I have given to this quilt is Raggedy & Friends. It is the first quilt that I have designed, stitched and pieced. I used vintage red buttons, red glass beads and knotted floss as embellishments throughout the quilt. I am still contemplating as to whether I will offer it as a free 12 month BOM (Block –Of-the-Month). It doesn’t happen very often but all my energy this past week was devoted to working outdoors in my gardens. Not one day was spent in the studio. Springtime does that to me and I just can’t seem to get enough of watching everything come to life. The days are getting warmer but the nights are still cool, so I’m holding off planting my containers and hanging baskets until later this week. This weekend is a holiday weekend and traditionally, that is when seeds are sown and tender annuals are planted. I won this biscuit barrel at a country auction last winter and to me, it epitomizes our Spring garden. Daffodils and violets are among the first flowers that bloom in our gardens and these hand painted ones are beautifully done. It sits on a tea cart in front of the patio doors that lead out into the back yard. Grab a cup of tea or coffee and join me on a tour. Here’s how things looked this morning at around 7:45 a.m. Let’s enter by the side gate, shall we? I won’t say too much more. Let’s just walk about and breathe in the fresh air, take in the heady aroma of the lilacs and listen to the birds singing. The last photo above is of the front of our house. Last Spring I planted the creeping phlox, thinking that it wouldn’t do very well but they are flourishing beyond belief so this past week I planted more in the other raised bed on the left. The two black iron urns will look a bit more colorful later this week with the addition of some annuals. This week I hope to get a start on my mini Irish Chain quilt. I recently joined a “Small Quilt Talk” list which I am thoroughly enjoying. 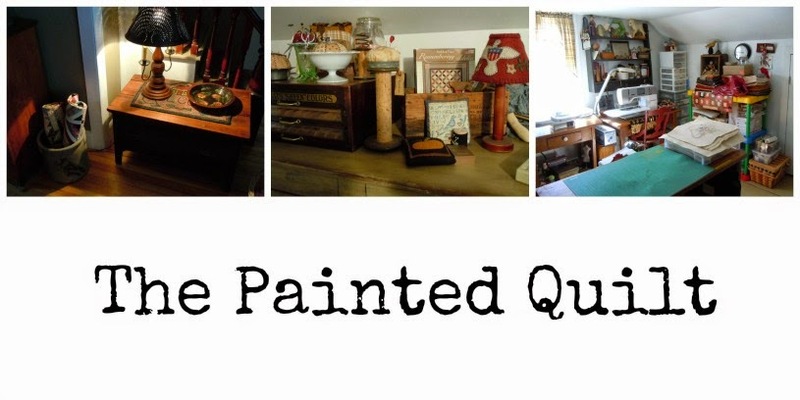 If you have an interest in small quilts, please visit Kathy’s blog, A Sentimental Quilter, for more details. Kathy is the author of the small quilts book ‘Remembering Adelia’, amongst others. And if you’d like to join the list, you may click on the button ‘Small Quilt Talk’ on my left sidebar. There is also a link on Kathy’s blog. The Irish Chain is the 9th Challenge Quilt that Kathy has designed for us. Friday of last week started out as a beautiful day. By 7:00 a.m. Mac, our Westie, and I were out taking our morning stroll through the back yard when I decided that I would take advantage of the weather to find a new home for the new perennials that I had purchased the day before. I had to replace a few plants that didn’t make it over the winter and others that were starting to thin out with age. Four hours later, everything was in the ground and it’s a good thing that I did it in the morning because by mid afternoon, the high winds and cool rain arrived which lasted throughout Saturday as well. The yukky weather forced me to stay inside and I managed to finish up a few projects that had been waiting patiently for my attention. I spent the better part of Saturday completing a pair of socks for my friend Lucie’s son to wear at his sister’s wedding next month. It is a French Canadian custom that if a younger sibling gets married first, the the elder sibling must dance with in this case, his sister, in his stocking feet. Lucie thought that it would be quite fine if her son’s socks were VERY noticible. The yarn that Lucie chose will probably glow in the dark! I hand quilted the two remaining mini nine patch doll quilts that I pieced a couple if weeks ago. I finished the first one at the end of April, just in time to give it to Lucie as one of her birthday gifts. I did all the piecing of the three minis with my Mom’s Featherweight machine and fittingly, I also used the Featherweight to sew the binding on the remaining two yesterday, Mother’s Day. It was a bittersweet yet meaningful way for me to pay tribute to my Mom who passed away on June 23rd, 2005 after a brief but courageous battle with cancer. The hand stitching was completed this morning. I used Civil War and shirting fabrics for the pieced tops and a brown and white toile for the backing. The finished quilts measure 17” square. The weather is supposed to remain cool until the end of the week at which time it’s supposed to return to more seasonal temperatures. It looks like the new plantings survived the cold, rainy weekend. The unpredictable wonders of Spring!